I was riding my horse with my father looking on. My mother, the original of the wicked witches, arrived with our stable boy. Mother begins to pick on me first by telling me I ride like a man and then by calling me an old maid. My father tried to stop her but she would have none of it. The stable boy piped in and I snapped at him and he leaves. I try to leave as well but Mother stopped me by her magic. I beg her not to use magic but she continues intimidating me. When she finally releases me I run off to the stables. Daniel, the stable boy, is in there brushing horses. I apologize for snapping at him. We kiss. Later I meet Daniel before dinner. He wants to know when I will tell my parents about us. I explain it’s my mother who is the problem. I try explaining the best I could without hurting his feelings. We are interrupted by the cries of someone begging for help. I take off on my horse to help a little girl whose horse is out of control. I rescue her. Yes, the grateful little child introduces herself as Snow White. I am in the castle ready to meet Daniel. Mother comes in and tells me I am not dressed right. She uses magic to change my riding clothes into a blue gown. Just then the King enters the room. He introduces himself and tells me the girl I saved was his daughter. His last wife passed away and he wants her to have a new mother. To my horror he proposes marriage to me. My father shakes his head but Mother accepts for me. I head to the stables and tell Daniel what has happened. At first he tells me I should go and be Queen. I tell him only he is important to me and I want him. We will run away together. Daniel pulls out a ring and slips it on my finger. Just then the happiest moment of my life is ruined when Snow is at the door of the stable. She has seen us and runs off. I frantically chase after her. She trips in the woods and I go to her. I explain to her that I am not in love with her father. I explain what love is. She comes around and tells me I must marry Daniel. I explain to her that she must keep this a secret for me. She promises. Snow is looking at flowers. Mother goes to converse with her. She tells Snow she loves how close that we have become and wishes that she had a relationship like that with me. She asks Snow if she knows why I have pulled away from her. Snow, thinking I may lose my mother if she doesn’t explain, gives up my secret. She tells Mother everything. Daniel and I meet at the stables. We are about to leave. Mother is there and ambushes us. She uses magic to keep us from leaving. She tells me that she did not work this hard to take us to the top for me to marry a stable boy. After we try reasoning with her she acts as though she understands. I hug her thinking this. Then she goes to Daniel. She tells him a speech about what a parent must do for the child. We believe she is talking about a future child that we may have. I should have known better. Mother reaches into Daniel’s chest and rips his heart out. I am on the ground trying to kiss him and wake him. She crushes his heart to dust. She tells me I must clean up and prepare to be Queen. I am numb. I stand there being fitted in my wedding gown. Snow comes in and tells me how beautiful I look. She believes I am marrying Daniel and further surprises me when she innocently tells me she told my mother everything. She just wanted to make sure that I didn’t lose my mother like she did. I keep my cool and tell her that Daniel ran away and I cannot wait to marry her father and be her step-mother. We are going to be a family. Snow hugs me. Mother comes and tells Snow to pack up and get ready. Once she is out of the room Mother commends me on playing my part so well. It suddenly hits me. I tell Mother that she must have known the King was traveling through and enchanted Snow’s horse. I walk away and say aloud I should have let her die. I stare longingly at my ring. Gold comes to my office asking for a favor. He wants me to make his legal troubles go away. In exchange he again promises to help me with Mary. He says that he will help find a way to get her to leave Storybrooke…and we all know what happens when people try to leave. David stops Emma in the street. He wants to see Mary. Emma will not help him. Gold is now with Emma and Mary. Emma does not approve of his legal advice. He wants to arrange a meeting between Mary and the DA. Sidney comes to the station and brings Emma a vase of flowers. He assures Emma that he is still working to uncover my involvement. As Sidney leaves Mary announces that she does want to meet with the DA. I just happen to show up with the DA. Through a one way mirror Emma and I look on. The DA tries flipping everything around on Mary to make her confess. Gold tries to end the interview, but Mary continues on incriminating herself answering the DA’s intimidating questions. Emma sits in a bench reading the fairy tale book. She is joined on the bench by August. He suggests that she backtrack in her investigating by looking at it from another perspective. They go to the toll bridge. August has a strange pain he will not discuss with Emma. She find a broken off piece of a shovel in the hole where the jewelry box was hidden. I look in on Henry and he seems to be asleep. He is actually awake and walkie talkies Emma and August to let them know that I am in the shower. Inside of my shed they find the shovel the broken piece matches up to. The next day Emma arrives at my house with a search warrant. I take her to the shed and she is shocked when the shovel is missing. I tell her that Mary will pay for ruining lives. Emma goes to August’s apartment and accuses him of tipping me off. I go to the station and tell Mary her trial will start tomorrow. 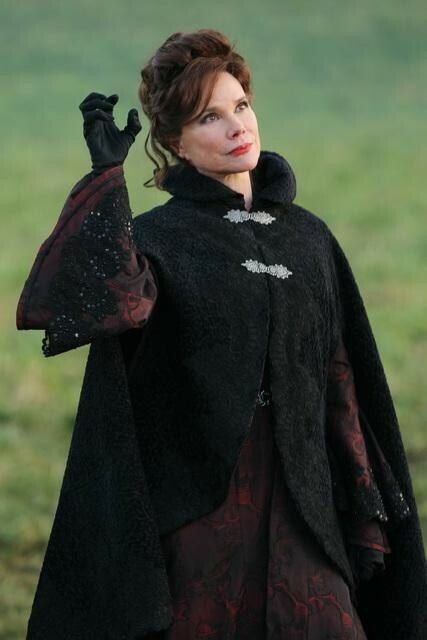 I let her know how happy I am one way or another she will be leaving Storybrooke. She breaks down and wants to know why I hate her. I lean in and tell her a little secret…I know she did not kill Kathryn. She looks shocked. I then add that she does deserve this. I hold the ring as I look I out the window. I tenderly talk to it telling Daniel we finally got her. Emma is furious with Gold. She tells him he is supposed to be helping. He tells her it’s not over and he plans to work his magic. As he leaves an angry Emma smashes the vase of flowers. She sees an electronic bug by the vase. She then goes to apologize to August telling him she now knows Sidney bugged the sheriff’s office. They hear screaming. It is Ruby. Ruby leads them to a body on the ground by the Diner. The body is alive and sits up. We see a dirty confused looking Kathryn.